Finnish melodic death metallers Insomnium don’t need any introduction anymore in the metal community. Throughout their career, they released six great studio albums, one better than the other. Their new opus, Winter’s Gate, has been released already on September 23rd this year. Let’s see if it’s as captivating as its predecessor, Shadows of the Dying Sun. First things first: it’s a concept album. And this album is actually just one, long song. 40 minutes in total. 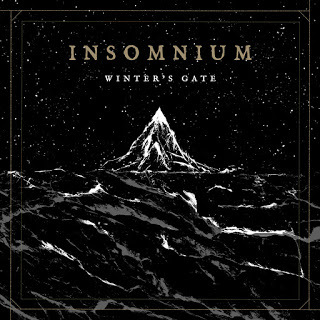 Luckily enough, Insomnium once again offer up a very entertaining, atmospheric, well-composed piece. We are drawn into a dark wintery landscape with howls of wind and a dreamy guitar solo. Tension is build up wonderfully and then released with one of, if not the, most powerful blastbeats in the band’s history. Thrashy riffs accompany the drums – an example of perfect songwriting. Up until minute 6:15, the overall tone remains melodic, the atmosphere rather melancholic. After that, tension rises again – and switches then back and forth between the darkness and hope before opening to a calm, melancholic passage, which makes the listener breathe again. Overall, the 40 minutes are filled with so many emotions and so densely packed atmosphere that it would be impossible to review everything here – and hey, you should still have something to discover, right? Overall, Winter’s Gate is a brilliant album packed with so much emotion and atmosphere that time just flies by. The production by Dan Swanö is excellent and really is just the crown on top a wonderful, well thought-through concept album. The journey you’ll take while listening is incredible, not least because Insomnium anno 2016 are more mature than ever. Winter’s Gate comes highly recommended, and to me has no flaws! 10/10.